Giovanni Tedesco... rewarding season at Floriana FC. Giovanni Tedesco took charge of his last match as Floriana coach yesterday after the Italian decided not to extend his contract with the Premier League club. 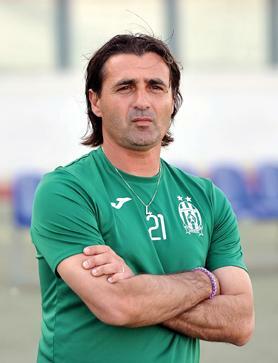 Tedesco had been at the helm of Floriana since April last year. The former Palermo and Perugia midfielder had answered the call of the then newly-elected president Riccardo Gaucci to replace Ian Dawes after the latter was dismissed with Floriana in relegation trouble. After helping Floriana retain their top-flight status, Tedesco was confirmed as coach for the following season. Under his guidance, Floriana went from relegation strugglers to top-four contenders, producing a strong challenge for a Europa League spot only to lose out to Balzan in the final weeks of the league campaign. “I would like to thank club president Riccardo Gaucci, the Floriana committee, players and fans for their help and support,” Tedesco told Times of Malta. “I have given a lot to the team this season. I’ve done everything in my power to take this team as far as I could. Floriana were already assured of ending the season in fifth place ahead of their final Premier League game against Sliema yesterday. In light of Floriana’s significant improvement since Tedesco’s appointment last year, many had presumed that he was going to stay on for next season but the affable Italian mentor said that he has completed his job. “When you are convinced that you can’t take the team further, it’s only right that you move on,” Tedesco said. “I’m not saying that this squad can’t improve further but as far as I’m concerned, I feel that my time here is up. Although Tedesco began coaching a few years ago after a long playing career, his work at Floriana will not have gone unnoticed. The 43-year-old is unlikely to be short of offers but he has yet to decide where to coach next season. “I’m still waiting,” Tedesco replied when asked about his plans for the future. “I have ambitions to progress in my coaching career. I’ve had a few telephone calls and I’m very pleased about that but at this moment in time, there’s nothing concrete. Although Tedesco looks to have what it takes to carve out a successful coaching career in a top footballing country, he has declared his willingness to stay in Maltese football. “Of course I would be interested in remaining here if the right offer comes along,” Tedesco said. “Working in the Premier League has been a great experience not only from a coaching perspective but also for me as a person. “The Maltese people are fantastic and this why I want to reiterate my gratitude to the Floriana players, club officials and supporters. “I come from Sicily which is very close to Malta. It is believed that Gaucci wanted Tedesco to stay in charge of the team for next season but now that the latter has decided to move on to pastures new, the Floriana president is expected to intensify his search for a new coach in the coming weeks. Sources told Times of Malta that Gaucci is intent on recruiting ano-ther foreign coach, most probably Italian, to lead Floriana next season. As for Tedesco, reports suggest that he could become a target for Birkirkara if they decide to part ways with Paul Zammit at the end of this season. Paul Fenech is likely to have played his last match for Birkirkara after the Malta midfielder revealed on his Facebook page that, on the club’s orders, he’s no longer training with the squad. In his post, Fenech, who is out of contract at the end of the season, said that he has been requesting an official letter from the club for the past four days but this has not been forthcoming. Fenech, who is being strongly linked with a move to Valletta, thanked his team-mates, coaches and fans for their support, adding that he will always respect Birkirkara. Valletta captain Ryan Fenech is another player who is expected to change clubs next season. The Valletta committee were due to meet yesterday to discuss Fenech’s situation after the Malta midfielder turned down the club’s offer to extend his contract. Rumours have been rife for some time that the former Ħamrun Spartans captain is eyeing a move to Balzan.